This trick will help you to determine wether a king can catch a pawn before it can be promoted. Of course you can calculate this on your own but the method you'll see here will allow you to figure it out much faster ( shortages of time are quite frequent in this part of the game). The square rule is nothing more than visualizing a square as shown in the image. The side of the square is made by the square on which the pawn is and the remaining squares to the promotion square. 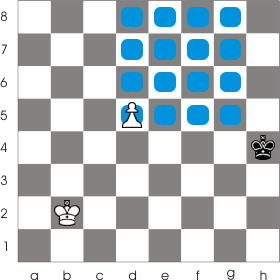 If the opposing king manages to enter the square then it will be able to catch that pawn just before it gets promoted and capture it. As you can see in the example the black king is not in the white pawn's square. But if it's Black's turn to move the king will enter the square and will eventually catch the pawn. However if it's White's turn to move the black king won't be able to reach the pawn in time. When establishing the square you should keep in mind that from the initial position the pawn can move two squares... so pay attention!